This area calls to both the highball climber and mutant inside all of us. With the main boulder being 20+ feet, it definitely has a presence in the park. 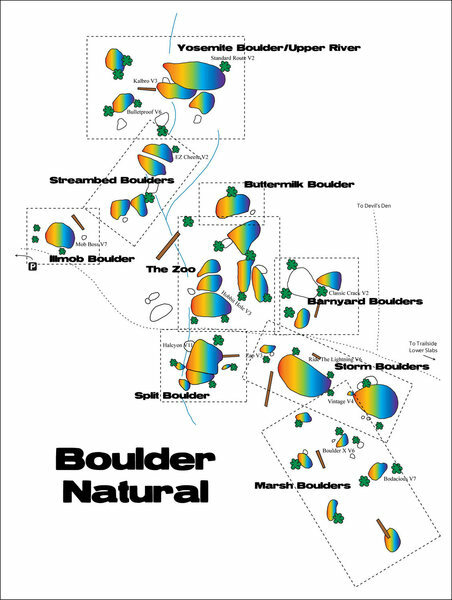 Testpieces abound as the Split boulder hosts a large concentration of hard and/or committing lines. Bones to Bits, an off-width, and The Morgue, a dihedral, will test your ability to stay calm off the deck. Halcyon, Confident Man, Three Amigos, My Little Pony, and Heart of Darkness are some of the hardest problems in the park. Shorter problems exist on the shorter boulders, and a couple of projects are still waiting for a send. Follow the trail from the parking lot until you cross a stream. There will be a huge boulder on your right. Thats the main split boulder. A quick overview map w/climbs shown for reference.